Visit Grimaldi during your stay in Liguria, Italy. Grimaldi lies on the French Italian border and is attractive for relaxation and for whiling away time. The multi-coloured houses are nestled against the steep mountain slopes and attract visitors to explore and to stroll around. Go hiking along the early mule paths used by ligurian traders and undertake hiking tours through the landscape of the French-Italian border. View the caves of Balzi Rossi and the Museo Preistorico dei Balzi Rossi. Enjoy the crystal clear water at the rock beach of Balzi Rossi in front of the prehistoric rocks. Grimaldi is a small village in the Ventimiglia municipality. The place was already inhabited in the Middle Ages and it was integrated into the Imperia province in the early Middle Ages. Grimaldi later became part of the Ventimiglia municipality. 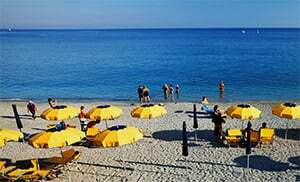 Grimaldi belongs to the Ventimiglia municipality and is a village in Imperia province which lies in the Liguria region. In the vicinity of Grimaldi are several other villages like : Ponte San Ludovico (1.2km), Latte (4.1 km) and Mortola inferiore (2.6 km). From Genoa take the highway exit to Ventimiglia and then drive towards Grimaldi.